Samhain in Ireland is often referred to as Halloween but realistically both are separate celebrations. Halloween originates from the ancient celebration of Samhain when changing of the seasons and the dead were honoured. Samhain (pronounced sow-en) marked the end of the bright half of the year known as ‘Beltane’ and the start of the dark half of the year in the Celtic New Year calendar. It began at sunset in the modern calendar of October 31st through to sunset on November 1, although festivities in Ireland would be over several days rather than one. This would have been an important time for the Irish druids, a time of dread and anticipation. Days got shorter and nights got longer, a sign that nature’s decay was about to begin. It also signals the end of the grazing season when only breeding animals are kept for the end of year slaughter. The harvest also had to be completed by this date. It has its roots in an old Irish tale that says if any crops are left out after November 1st they may be spoiled by the Faeries. 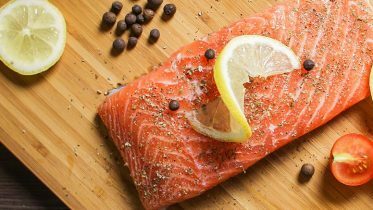 Food was offered to the gods and the dead with great feasts being held. Guisers would dress up to scare off evil spirits. They would go from home to home gathering donations of food to offer up to the gods and dead, a ritual that was also followed in Scotland. 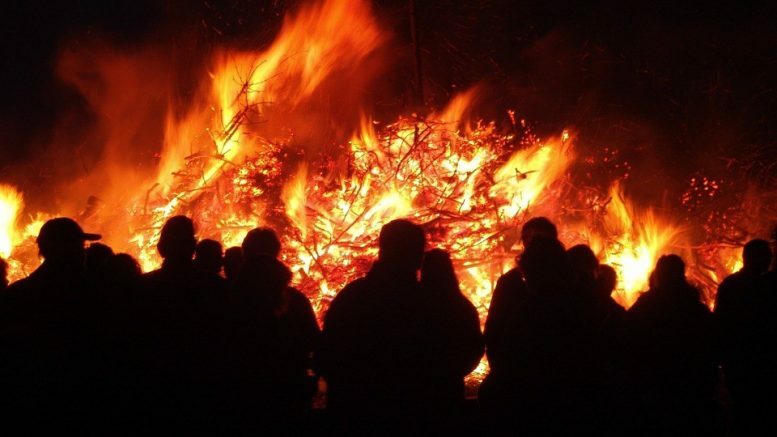 Over 2,000 years ago in Ireland there were four fire festivals to mark the turning of the seasons, Samhain being important as it was the start of the dark half. The beginning of Samhain was marked by the Great Fire Festival at the hill of Tlachtga (Hill of Ward). The hill was named after a powerful druidess called Tlachtga who died giving birth to triplets, she was the daughter of Mug Ruith the druid. 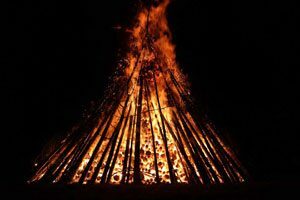 The Great Fire Festival played an important role in the rituals of Samhain, it gave light and warmth for the dark days ahead. The druids of Ireland gathered around the Great Fire to offer sacrifice to all the gods. ll the fires in Ireland would be extinguished and people were forbidden to kindle fires except from this great fire. The fires would guide the path of friendly spirits and the people would wear masks and costumes to warn off any evil spirits that found their way from the other world. The great fire on Tlachtga would’ve been visible from the hill of Tara which was the primary ceremonial centre of Ireland where the coronation seat for the High Kings was held. The Feis of Tara would have been held at this time which lasted several days, 3 days before Samhain and 3 days after. This was a great gathering of people who honoured the dead, proclaimed laws, and festivities to entertain. It was a time of truce, all feuds set aside and disputes were settled by the Ollamhs who were high ranking people in society. It’s at this time of year the link between this world and the other world is at its thinnest. This allows the dead to return to this world using doors of the sidhe so they could warm themselves amongst the living. Great feasts were held in honour of the dead with a place set for ancestors who may visit from the otherworld. After the large supper the untouched plate of food would be placed outside to be left for the wee folk such as Faeries and even Pookas who were very active on this night. Celebrating the dead was of a great importance which is evident from the magnificent cairns and passage tombs built across the country. Some of the cairns and tombs played a significant role during Samhain, this is still visible today. On Sliabh na Calli (hill of the witch or hag), visible from Tlachtga, there are 35 cairns or passage chambers built over 5,000 years ago during Neolithic times. On the Samhain sunrise a standing stone within one of the chambers is illuminated by the sun marking the cross-quarter days. At the hill of Tara is the Mound of Hostages, also built in Neolithic Times. It’s a passage tomb with an estimated 250-500 bodies buried underneath in layers. The dead in the mound were cremated and their ash spread on the floor and covered by stone slabs. The tomb was in use right up to the Bronze Age period. 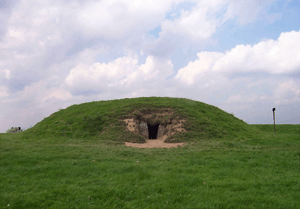 During the Samhain sunrise the sun illuminates the inside chamber of the Mound of Hostages. The seasonal change was often connected to death. They buried their dead and those with great importance were often buried on hill tops. The burial lasted for several days with people grieving on their passing which was followed-up with sporting events and festivities. These events became known as Óenach, a fair of a large gathering of people. Samhain is often mentioned in Irish Mythology with tales such as that of Aillén Mac Midgna who was a fire breathing goblin from the otherworld and a member of Tuatha Dé Danann. Every Samhain Aillén would arrive at Tara and burn it down and he did this for 23 years until he was killed by the young Fionn Mac Cumhaill. There is also tales of the Nemed people who feared the mysterious Fomorians who represented personifications of chaos, darkness, death, blight and drought. The Nemed’s paid a heavy tax to the Fomorians by giving them two thirds of all the wheat, butter and milk that was produced. This tax was paid on every Samhain at the tower of Conand on Tory Island until they fled Ireland. There are many more events in Irish Mythology that occurring during Samhain which reflects how important this time of year was to the ancient Irish. There is no doubt that our celebrations of Halloween today originated from the ancient celebrations of Samhain. The ancient traditions were finally replaced with the arrival and spread of Christianity in Ireland who incorporated their own holidays such as All Saints Day falling on November 1st and All Souls Day on November 2nd.